With Father’s Day right around the corner, I thought what better way to prepare than to host a giveaway of a Lifetime Leather Co. product? The wonderful Ty Bowman has generously agreed to giveaway one of his most popular products, the standard size, cognac leather toiletry case, complete with a monogram personalization. To find out how to enter read below! My wonderful husband, Nick, just turned 28. After 9 years together, and almost 4 years of marriage, I often have to get creative with my gift giving. Many of the things he has on his wish list are items I either know nothing about (a new bumper for the truck, bed extender, or new wheels) or can’t afford (like a new bumper, bed extender, or new wheels). In moments like these I turn to the internet and begin looking around, hoping something will strike me. 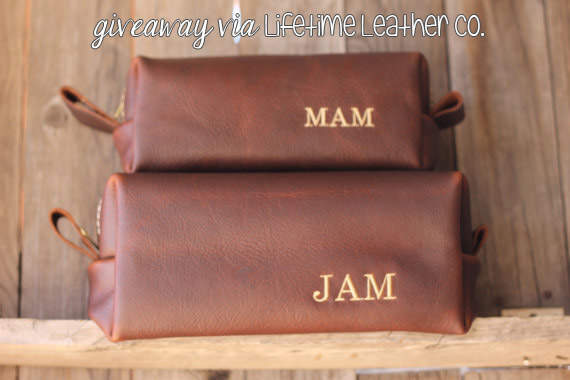 It was just one of those instances that brought me to Lifetime Leather Co. on Etsy. I had already “favorited” a few items I liked for his birthday, when I came across these beautiful toiletry bags. Nick currently keeps his hair clippers, electric razor, and various other knick knacks in an old, beat up, black (but now it is really gray), toiletry bag. After having to look at that thing since we started dating, I decided it was time for a change. 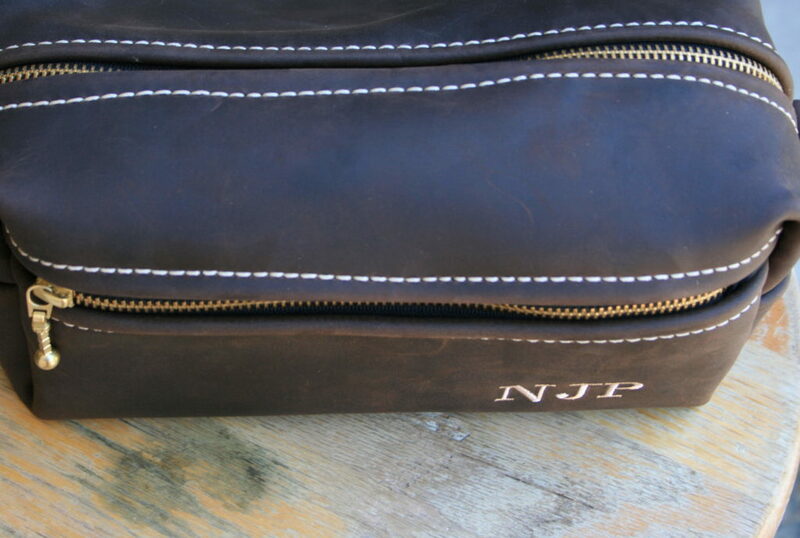 I selected the leather bag I wanted, typed in the NJP initials for the front and NP for the side, and placed my order. I had already had a lot of contact with Ty. Ordering a personalized gift last minute made me nervous about the necessary delivery date before Nick’s birthday. He ensured me time and time again it would arrive by April 12th, 2 days before the big day, and he was true to his word. On April 12th the package arrived. I snuck it in the house and opened it up. It truly is a work of art. The leather is a far higher quality than I was expecting. The color is dark and beautiful. The leather is soft and thick. 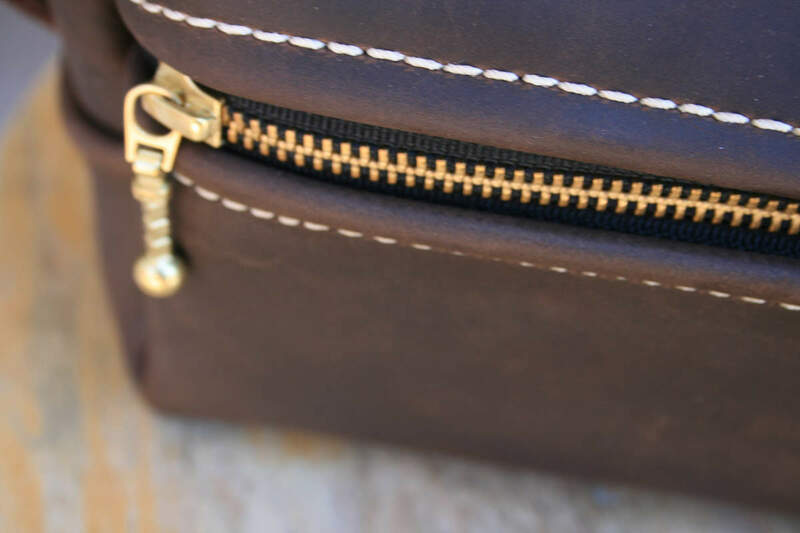 The zipper has an understated, classic look. The bag feels durable, the inside is washable. I was tempted to keep if for myself, if only I hadn’t had Nick’s initials stitched into the side. The best adjective that comes to mind when I think about the leather is creamy. It feels creamy. Weird? Perhaps, but creamy certainly sounds nice. Everything about it was perfect. Nick likes to joke that with every nice gift I give him, I am attempting to class him up. This bag certainly helps in that secret (not-so-secret) pursuit of mine. On his future business trips, vacations, or other outings, that require his toiletry bag to come along, he will look like one dapper fellow. This bag is the perfect gift for any father, husband, son, or person of the male or female gender. I don’t doubt this item can withstand a lot of use, I think the beautiful leather will only get better with time. 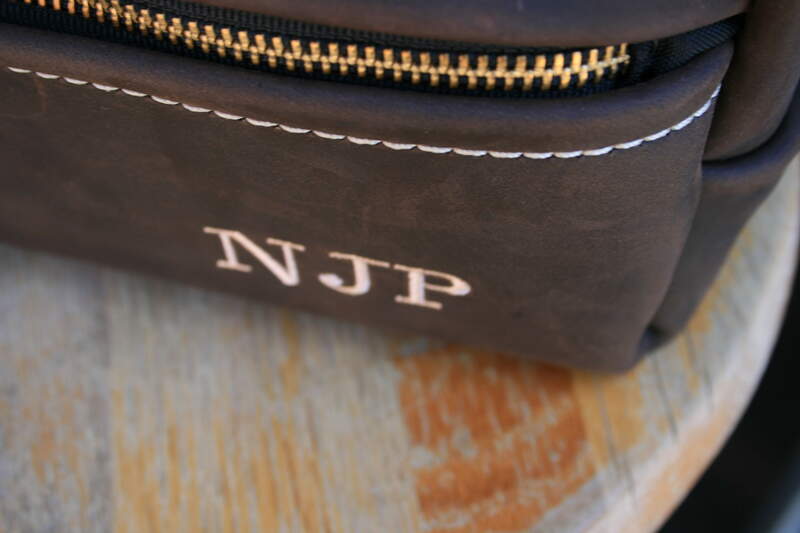 Enter below for a chance to win a personalized toiletry bag of your very own! The contest will end next Wednesday, 5/14/14. To enter all you have to do is follow Ty on his Instagram here. Comment in a separate comment with the username you are following his Instagram under. 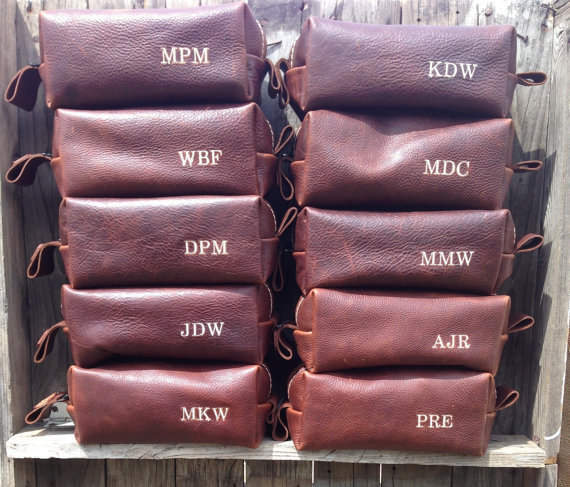 For a second entry all you have to do is visit Ty Bowman’s Etsy shop, Lifetime Leather Co., and like his shop. Comment below with the username you liked his shop under. The contest will close at midnight on 5/14/14. The winner will be randomly selected using the plugin, And the Winner Is… The winner will be notified via e-mail, and will have 24 hours to confirm. If they do not confirm in the required time frame, a new winner will be selected and contacted. Thanks for taking the time to check out my blog and enter my giveaway! Help me spread the word about my blog and all these amazing Etsy shops by sharing with others.